There are times in my life when I have been truly amazed at my own fearlessness while doing INCREDIBLY intimidating things. ME – afraid of heights and PETRIFIED of falls – in a harness, climbing a 50 foot tower, only to JUMP OFF of the top and be lowered to the ground by another person – a real person – just like me. ME – telling my kids to “be careful” while they ride their bikes with helmets and training wheels – doing backflips in the air while bouncing on a trampoline. Rather, ME – in a harness. 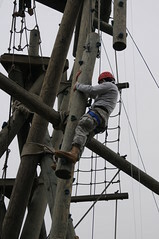 NEVER would I have considered climbing 50 feet above the ground or flipping upside-down and all around on a trampoline! But with a harness and a skilled belayer, the seemingly impossible becomes DO-ABLE! Even FUN! Having caught wind of the sheer possibilities, now that I’ve BEEN THERE & DONE THAT, I’m SO READY to DO IT AGAIN! We choose the (seemingly) “safe” path – the one WITHOUT 50 foot high towers. The one that may require some running and stretching, but NO bouncing and DEFINITELY NO back flips. The result is that we may succeed at avoiding some of the things that make us uncomfortable or stress us out, but we ALSO MISS some of the greatest possibilities God may be bringing our way. It may be inconceivable that God would ask YOU to climb that “tower”, make that move, take that job, solve that problem… But with that challenge comes God’s Holy Spirit – YOUR HARNESS! – which is ever-present and constantly attached to your heart through God’s Word. With that upcoming feat comes God’s Son, Jesus Christ – YOUR ROPE! – firmly connected to your heart and ever-present with God the Father. And with that risk comes an EXPERT BELAYER – our Dad, our ABBA – whose grip on your rope never loosens. Whose hands never tire. Whose strength NEVER FAILS. No task or challenge, however daunting, is impossible when you allow yourself to be harnessed in by the One who puts each star in the sky and even calls them all by NAME! “Ready,” you answer – sometimes in a barely audible whisper, sometimes with a confident grin. “CLIMB ON!” says your Lord, and you know that it doesn’t matter whether you FEEL READY INSIDE because once the first step is taken, you’ll find that your apparatus is holding – it’s WORKING! – your Belayer will not let you fall. And you’ll CLIMB ON, in spite of how you feel, because His Spirit will not let you go. His Son will ALWAYS show you the way and keep you on course. God HIMSELF will hold tightly to your rope as you draw closer to the top of HIS mountain or HIS tower. God HIMSELF will steady you, 10 feet off the trampoline, as you let go of gravity’s pull and put head over heels – again and AGAIN – for the incredible, simple JOY of living life HIS WAY. Lord, help me prepare to climb the next mountain that comes my way. Give me the guts to look at Your world differently – even from upside-down, if that’s the view I need to see. Light inside of me the flame of wonder and WOW! And once it’s finished, the challenge met & the job well done, may I look behind me and realize that I could never have DREAMED that You would do THAT through ME! This entry was posted in Claiming TRUTH Where You FIND IT and tagged Alpine Tower, Belaying, climbing tower, God, Holy Spirit, Jesus, risk, risk taking, Rope by Pink Shoes Ministries. Bookmark the permalink. Hi, How truely you are following your inner light matters. The light inside you is at the center of your being.. and there is no entry there with your specs ON. Neither will a turban do.. Meditation is the key to get in touch with your innner light and I feel everyone should meditate and pray like Master AD tells us to do. You may like to visit. Thank you for the read! Your comments show a great deal of passion for the spiritual, which is something I too possess. My own path is marked with evidence of the Light, and the more open I am to His leading, the more closely my life begins to reflect that Light. Let’s allow God’s Light to SHINE in us (this is what Pink Shoes Ministries is all about)! Blessings to you!